1712 ~ 1730: born in Kyôto. Son of Yoshizawa Ayame I, his first name was Yoshizawa Kikumatsu. He was adopted by Yamashita Kinsaku I and received the name of Yamashita Sennosuke at a young age. 18th day of the 1st lunar month of 1717 : his uncle Yamashita Kyôemon I died. 1731: first stage appearance, on Miyajima Island, where he performed under the name of Yamashita Tomijûrô. 1732: he took the name of Yamashita Kyôemon II while on tour in Ise. Fall 1734: Kyôemon settled in Ôsaka. 11th lunar month of 1734: Yamashita Kyôemon II took the name of Yamashita Matatarô I, became tachiyaku and played at the Kado no Shibai the role of Kokonoe Otowanojô in the kaomise drama "Shin Yakata In'yô no Ishizue"; his stage partners were Sawamura Otoemon I, Izumikawa Sennosuke, Tamiya Shirogorô, Kamakura Heikurô I, Matsushima Moheiji and the zamoto Nakayama Shinkurô I. 11th lunar month of 1735: Matatarô played at the Kado no Shibai the role of Shikijima Unemenosuke in Sadoshima Saburôzaemon's kaomise drama "Ôyamato Kane no Kinzan". He achieved a great success by performing the shôjô dance. Fall 1747: Matatarô went back to Kyôto. 11th lunar month of 1747: Matatarô played at the Kitagawa no Shibai the role of Nakahara Ukyô in the kaomise drama "Teikin Ôrai Manzoku Kagami"; his stage partners were Sakakiyama Koshirô II, Sakakiyama Shirotarô II (the two actors of the Sakakiyama clan celebrated their shûmei), Asao Motogorô I, Fujioka Daikichi, Fujikawa Heikurô, Sanogawa Hanazuma II, Nakamura Kiyosaburô I, Kasaya Matakurô I, Nakamura Matsubê I, Takenaka Heikichi and Nakamura Shirogorô III. Matatarô achieved a great success by performing a yakko role in a yari odori. 1st lunar month of 1748: Matatarô's rank in the Kyôto hyôbanki, tachiyaku section, was jô-jô-kichi (superior - superior - excellent). 1st lunar month of 1751: first Kabuki adaptation of the puppet theater drama "Tamamo-no-Mae Asahi no Tamoto", which was produced in Kyôto by Miyako Handayû at his theater; Matatarô played the roles of Miuranosuke Yoshiaki and Abe Unemenosuke [casting]. 11th lunar month of 1752: Matatarô became zamoto in Kyôto, producing at the Minamigawa no Shibai the kaomise drama "Hatsubaika Asahi no Minato", in which he played the roles of Wanya Kyûbê and Ôtomo Irinojô. 1st lunar month of 1753: first Kabuki adaptation of the 5 acts puppet theater drama "Yamatogana Ariwara Keizu", which was produced as a new year drama at the Minamigawa no Shibai by Matatarô and in which he played the roles of Kurozuka Heima's wife Murasame and Yomosaku [casting]. 2nd lunar month of 1753: Matatarô produced in the same theater the ni-no-kawari drama "Keisei Naruo no Umi", in which he played the roles of Yaban Nitasuke and Nagaharaya Ibei. 18th day of the 7th lunar month of 1754: his elder brother Yoshizawa Ayame II died. 11th lunar month of 1754: Matatarô played at Hoteiya Umenojô's theater in Kyôto the role of Tsubashi Tôsaku (in reality Imai Tarô) in the kaomise drama "Fûkigusa Aioi Genji", which was produced by Somematsu Matsujirô. 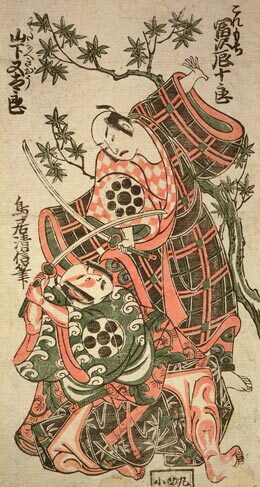 This drama was in fact the first Kabuki adaptation of the puppet drama "Yoshitsune Koshigoejô" [more details] and the role of Tôsaku was the same as Gotobê in "Yoshitsune Koshigoejô". Fall 1755: Matatarô went to Edo. 11th lunar month of 1755: Matatarô played at the Nakamuraza in the kaomise drama "Arigatashi Yunzei Genji"; his stage partners were Ichikawa Ebizô II, Ichikawa Danjûrô IV, Nakamura Shichisaburô II, Tomizawa Tatsujûrô, Ichikawa Yaozô I, Nakajima Mihoemon I, Sawamura Sôjûrô II, Miyazaki Jûshirô II, Matsushima Moheiji, Nakamura Tomijûrô I, Nakamura Kiyosaburô I, Osagawa Tsuneyo I, Nakamura Denkurô II and Yamashita Kinsaku II. 1st lunar month of 1756: Matatarô's rank in the Edo hyôbanki, tachiyaku section, was jô-jô-kichi (superior - superior - excellent). 14th day of the 1st lunar month of 1756: the Nakamuraza and the Ichimuraza were destroyed in a fire. 2nd lunar month of 1756: the Nakamuraza was rebuilt and Matatarô played the role of Nagoya Sanza in the new year drama "Kotobuki Mimasu Soga"; his stage partners in the roles of Fuwa Banzaemon, Katsuragi (Sanza's lover) and Banzaemon's wife were Ichikawa Danjûrô IV, Nakamura Kiyosaburô I and Nakamura Tomijûrô I. 8th lunar month of 1756: Matatarô played in the same theater the roles of Takebe Genzô and Kakuju in the drama "Sugawara Denju Tenarai Kagami". 11th lunar month of 1756: Matatarô played at the Nakamuraza the role of Toyoshima Saemon in the kaomise drama "Masakado Shôzoku no Enoki", which celebrated the arrival of Arashi Tominosuke I in Edo. 11th lunar month of 1757: Matatarô moved to the Moritaza and performed in the kaomise drama "Ikioi Wada Gassen". Fall 1758: Matatarô went to Ôsaka. 11th lunar month of 1758: Matatarô played at the Naka no Shibai in the kaomise drama "Shitennô Chikara Kurabe"; his stage partners were Ichikawa Danzô III, Yamamoto Kyôshirô I, Ichinokawa Hikoshirô II, Yoshizawa Sakinosuke II, Nakamura Kumetarô I and the zamoto Arashi Kichisaburô I. 1st lunar month of 1759: Matatarô's rank in the Ôsaka hyôbanki, "Kurokichi Shitennô" section ("the big four with the excellent character written in black"), was jô-jô-kichi (superior - superior - excellent). The 3 others actors, who belonged to this "Big Four" section, were Ichikawa Danzô III, Yamamoto Kyôshirô I and Nakayama Shinkurô I. 11th lunar month of 1759: Matatarô performed at the Naka no Shibai in the kaomise drama "Mibae Soga Azuma Tanzen". 7th lunar month of 1760: Matatarô played in the same theater the role of Kajiwara Genta Kagesue in the drama "Hirakana Seisuiki". 11th lunar month of 1761: Matatarô performed at the Naka no Shibai in the kaomise drama "Miyo no Hana Yunzei Kagami". 2nd lunar month of 1762: Matatarô appeared on stage for the last time, in Kyôto, playing the roles of Tatsuta Unemenosuke and Funabashi Tomonoshin in the drama "Keisei Shiunzan", which was produced by Sanogawa Wakamatsu. 16th day of the 9th lunar month of 1762 : Matatarô died in Ôsaka. Yamashita Matatarô I was a talented actor, who was born in an onnagata family but became a popular tachiyaku, achieving fame for himself from the middle of the 1730s to the beginning of the 1760s, not only in Kyôto or Ôsaka but also in Edo where he spent 3 successful seasons. His physical appearance and his kôseki were both great and he was an outstanding dancer. He was equally at ease in both sewamono and jidaimono, and excelled as a wagotoshi (yatsushi). The 16th day of the 9th lunar month of the 12th year of the Hôreki era was the 1st of November 1762 in the western calendar.